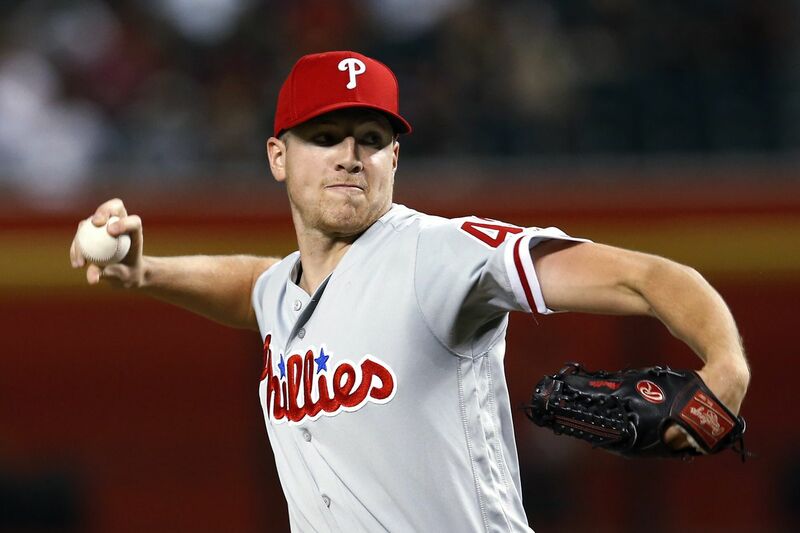 Nick Pivetta will take the mound for the Phillies Tuesday against Boston. The Phillies, who woke up this morning in second place for the first time since the Fourth of July, last saw the Boston Red Sox during the final two days of July at Fenway Park. They split a two-game series with the best team in baseball, losing the first game, 2-1, in 13 innings before rebounding with a 3-1 victory the next night behind a brilliant pitching performance from Jake Arrieta. Aaron Nola and Arrieta held the high-powered Red Sox to two runs on 10 hits over 15 innings, and the Phillies' bullpen allowed one run on one hit and one walk in 6 1/3 innings. That's some pretty good pitching against a team averaging a major-league-leading 5.49 runs. Boston's offense did not stay down for long. Since that two-game series against the Phillies, the Red Sox are 10-1 and have hit .292 and averaged 7.9 runs. Phillies’ young players have put the playoffs within reach, but can they finish the job? Boston’s J.D. Martinez, right, leads the major leagues with 37 home runs and 104 RBIs. Phillies should have signed J.D. No, we're not going to revisit 1998, the year the Phillies let J.D. Drew re-enter the draft after selecting the Florida State outfielder with the second overall pick the year before. The J.D. they could have signed this offseason was Martinez, the outfielder/designated hitter we will see playing for the Red Sox the next two days. Boston signed the free agent for five years and a shade under $110 million. The Phillies chose to spend their free-agent money on Carlos Santana, giving the switch-hitting first baseman a three-year deal worth $60 million. Obviously, Martinez cost the Red Sox significantly more money overall, but only $2 million more per season. Compare the careers of the two before this season, and it's understandable why the Phillies opted for a shorter-term deal with Santana. Santana, 32, had averaged 32 doubles, 24 home runs and 81 RBIs over the last seven seasons while hitting .249 with a .363 on-base percentage and .808 OPS. During that same period, Martinez had averaged 24 doubles, 22 home runs and 68 RBIs while hitting .285 with a .342 on-base percentage and an .857 OPS. Martinez had shown a lot more power in two of the last three seasons, and he would have allowed the Phillies to keep Rhys Hoskins at first base. The Phillies were not sure they would be in contention this season, and they probably would have had to spend more than the Red Sox to get Martinez. Hindsight, as they say, is 20-20, but it can also be painful. Martinez enters the series with the Phillies hitting .333 with a major-league-leading 37 home runs and 104 RBIs. Santana, on the other hand, is hitting .215 with 17 home runs and 66 RBIs. He does walk a lot, but the Phillies had to be hoping for more when they signed him. The Phillies have the youngest roster in baseball, and now they are in the middle of a pennant race. Our Scott Lauber wonders if they will be able to finish the job. Veteran pitcher Jake Arrieta, who went to the playoffs in each of his last three seasons with the Chicago Cubs, suggested the Phillies focus on their own business rather than worrying about what the Atlanta Braves and Washington Nationals are doing. The Braves, by the way, swept a doubleheader Monday against the Marlins to take a one-game lead in the NL East. The arrival of the Red Sox will create some excitement down at Citizens Bank Park the next two nights, but there are some soft spots in the schedule before the Phillies reach the finish line. I look at the Phils' schedule over the final 45 games, and it includes 17 games against the New York Mets and Miami Marlins, two teams well below .500. The Phillies, in fact, have more remaining games against teams more than 10 games under .500 than any of the 10 teams in the National League with winning records. Tonight: Nick Pivetta faces Rick Porcello in opener vs. Bosox, 7:05 p.m. Tomorrow: Vince Velasquez vs. Nathan Eovaldi, 7:05 p.m.
Thursday: Let's play two against the New York Mets, 4:05 p.m.
Friday: It's Players Weekend, so look for the weird names on the backs of jerseys, 7:05 p.m.
Sunday: The Phillies make an ESPN Sunday Night Baseball appearance against the Mets in Williamsport, 7:05 p.m.
Rhys Hoskins batted .048 during the Phillies’ six-game road trip to Arizona and San Diego. The Phillies batted just .184 and averaged 2.5 runs during their 2-4 road trip to Arizona and San Diego. They had just 10 extra-base hits and batted .122 (5 for 41) with runners in scoring position. It was the Phillies' worst offensive production on the road since their season-opening trip to Atlanta and New York. As a fan since 1964 I've been through a lot with the Phils. But this year's defensive problems are downright embarrassing. We always took pride in our defense, Gold Glove winners or at least contenders. High fielding averages. Is anyone trying? Does anyone care? Or is fielding now an obsolete idea, like some think win-loss records are for pitchers? By the way, love the daily newsletter. Keep up the great work. Answer: Janice, thanks for the kind words and for reading Extra Innings. Enjoyed your comments and your questions. I assure you they are all trying and they all care, but there's no denying the Phillies have been a bad defensive team this season. I think you can attribute it to a couple of things. One is that the team has used the shift far more this season than in any previous season, and that leads to players' being in uncomfortable positions on the field. Two, you also have some players (Rhys Hoskins and Scott Kingery) who are playing new positions. That said, this team needs to be better for the remainder of this season on defense and really needs to become considerably better next season.